This specific example is for a router on a stick, but is very easily adapted for however many NICs you have. The VyOS interface is assigned the .1/:1 address of their respective networks. 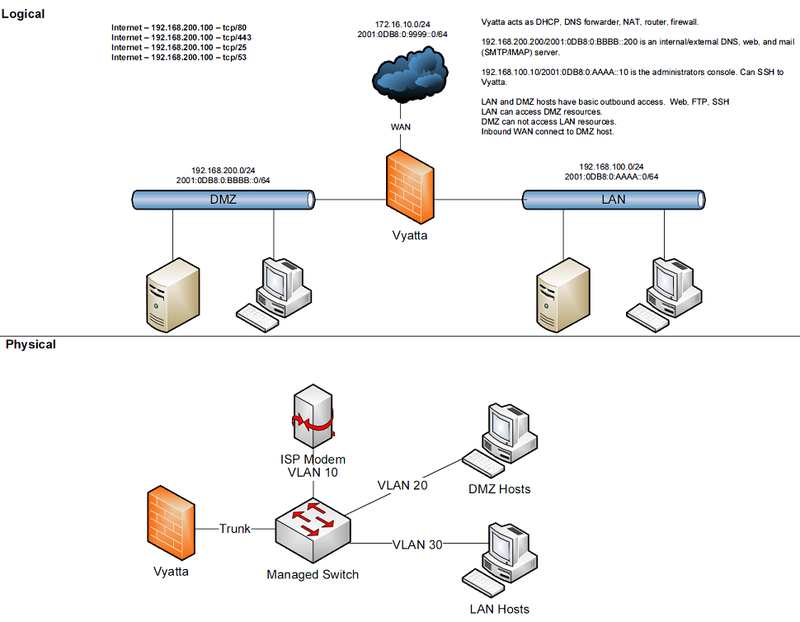 WAN is on VLAN 10, LAN on VLAN 20, and DMZ on VLAN 30. Each interface is assigned to a zone. The interface can be physical or virtual such as tunnels (VPN, pptp, gre, etc) and are treated exactly the same. Traffic flows from zone A to zone B. That flow is what I refer to as a zone-pair-direction. eg. A->B and B->A are two zone-pair-destinations. Ruleset are created per zone-pair-direction. I name rule sets to indicate which zone-pair-direction they represent. eg. ZoneA-ZoneB or ZoneB-ZoneA. LAN-DMZ, DMZ-LAN. In Vyatta, you have to have unique Ruleset names. In the event of overlap, I add a "-6" to the end of v6 rulesets. eg. LAN-DMZ, LAN-DMZ-6. This allows for each auto-completion and uniqueness. In this example we have 4 zones. LAN, WAN, DMZ, Local. The local zone is the firewall itself. If your computer is on the LAN and you need to SSH into your Vyatta box, you would need a rule to allow it in the LAN-Local ruleset. If you want to access a webpage from your Vyatta box, you need a rule to allow it in the Local-LAN ruleset. In rules, it is good to keep them named consistently. As the number of rules you have grows, the more consistency you have, the easier your life will be. The first two rules are to deal with the idiosyncrasies of Vyatta and iptables. Zones and Rulesets both have a default action statement. When using Zone-Policies, the default action is set by the zone-policy statement and is represented by rule 10000. It is good practice to log both accepted and denied traffic. It can save you significant headaches when trying to troubleshoot a connectivity issue. By default, iptables does not allow traffic for established session to return, so you must explicitly allow this. I do this by adding two rules to every ruleset. 1 allows established and related state packets through and rule 2 drops and logs invalid state packets. We place the established/related rule at the top because the vast majority of traffic on a network is established and the invalid rule to prevent invalid state packets from mistakenly being matched against other rules. Having the most matched rule listed first reduces CPU load in high volume environments. Note: I have filed a bug to have this added as a default action as well. It is important to note, that you do not want to add logging to the established state rule as you will be logging both the inbound and outbound packets for each session instead of just the initiation of the session. Your logs will be massive in a very short period of time. In Vyatta you must have the interfaces created before you can apply it to the zone and the rulesets must be created prior to applying it to a zone-policy. I create/configure the interfaces first. Build out the rulesets for each zone-pair-direction which includes at least the three state rules. Then I setup the zone-policies. Zones do not allow for a default action of accept; either drop or reject. It is important to remember this because if you apply an interface to a zone and commit, any active connections will be dropped. Specifically, if you are SSH’d into Vyatta and add local or the interface you are connecting through to a zone and do not have rulesets in place to allow SSH and established sessions, you will not be able to connect. The following are the rules that were created for this example (may not be complete), both in IPv4 and IPv6. If there is no IP specified, then the source/destination address is not explicit. Since we have 4 zones, we need to setup the following rulesets. Even if the two zones will never communicate, it is a good idea to create the zone-pair-direction rulesets and set enable-default-log. This will allow you to log attempts to access the networks. Without it, you will never see the connection attempts. This is an example of the three base rules. Here is an example of an IPv6 DMZ-WAN ruleset. Once you have all of your rulesets built, then you need to create your zone-policy. Start by setting the interface and default action for each zone. In this case, we are setting the v6 ruleset that represents traffic sourced from the LAN, destined for the DMZ. Because the zone-policy firewall syntax is a little awkward, I keep it straight by thinking of it backwards. dmz-lan policy is lan-dmz. You can get a rhythm to it when you build out a bunch at one time. In the end, you will end up with something like this config. I took out everything but the Firewall, Interfaces, and zone-policy sections. It is long enough as is. If you are using a IPv6 tunnel from HE.net or someone else, the basis is the same except you have two WAN interface. One for v4 and one for v6. You would have 5 zones instead of just 4 and you would configure your v6 ruleset between your tunnel interface and your LAN/DMZ zones instead of to the WAN. Notice, none go to WAN since WAN wouldn't have a v6 address on it. You would have to add a couple of rules on your wan-local ruleset to allow protocol 41 in. This page was last edited on 15 February 2019, at 18:02.